It's A Family Adventure! 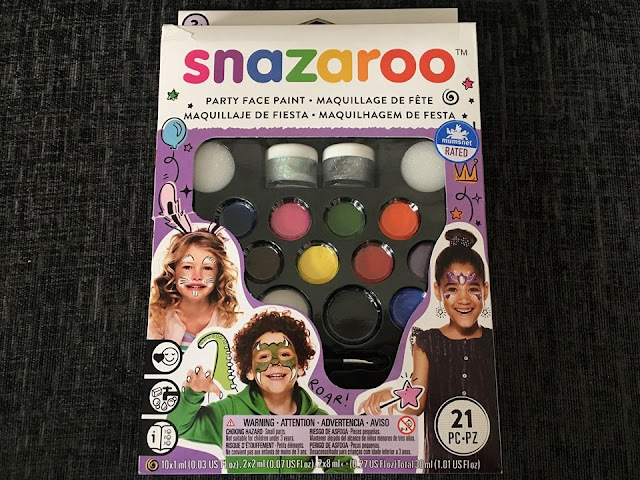 : Face Painting with the Snazaroo Party Face Paint Kit! Face Painting with the Snazaroo Party Face Paint Kit! Most children enjoy getting their face painted and lets face it some adults (including myself) do too! This can be for many reasons, whether it be Halloween and you are wanting to create some spooky special effects, or your child might be heading to a fancy dress party and wants the perfect make up to match the costume. Another fun reason for face painting though is role play, where you can help your child turn into any character they want to be and enter a magical world of make believe, where they can pretend and act just like their favourite cartoon character or animal. 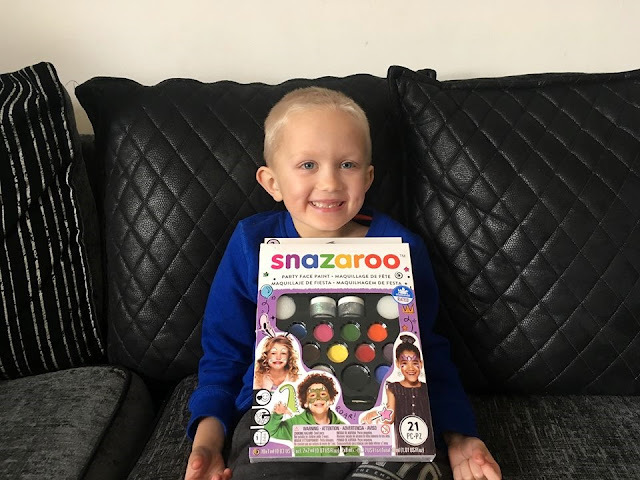 If you are a regular reader to the blog, then you will know that Riley absolutely loves pretend play, whether this be creating a new scene in his dolls house, pretending he's the station controller whilst playing with his trains, or becoming a racing car driver whilst speeding his cars around the living room. He absolutely loves it! 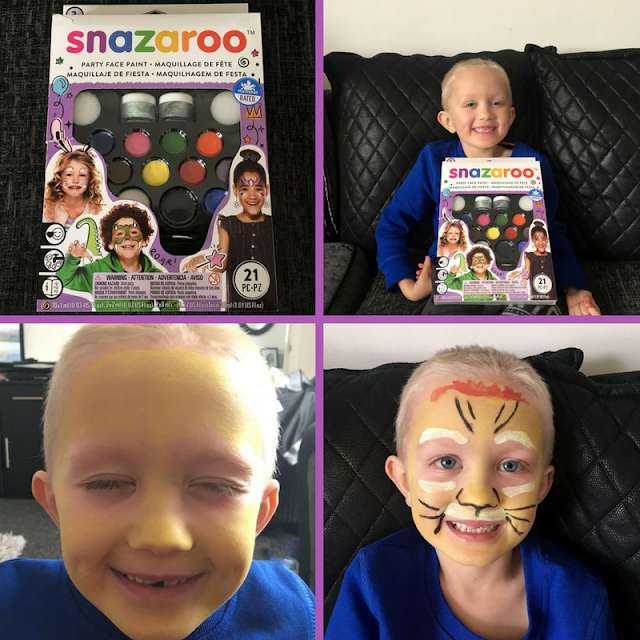 We were therefore really excited to learn more about the the face painting products from Snazaroo, when we were also given the opportunity to try out their popular Snazaroo Party Face Paint Kit. 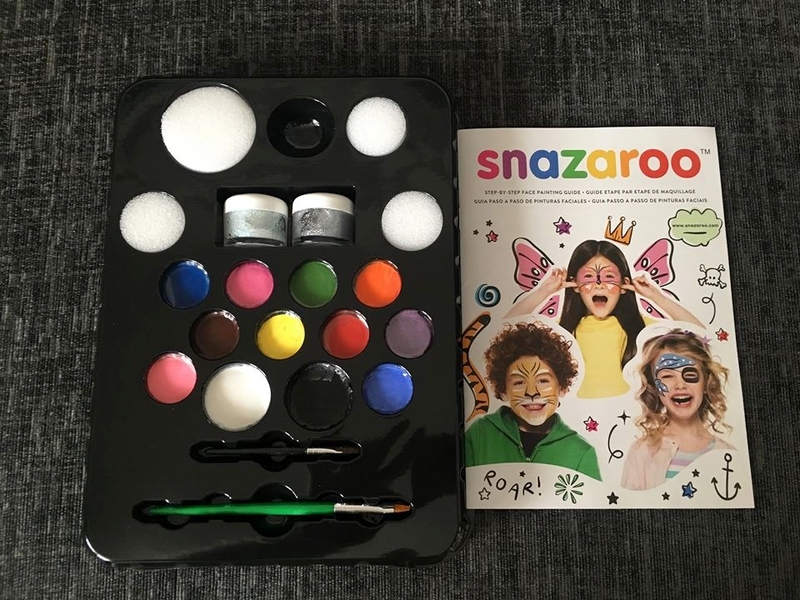 Snazaroo are the nation's leading face paint brand and their new step by step face painting guides mean children are transformed in no time. Using the easy to follow tutorials you can create some fantastic characters or designs. I will be honest, my face painting skills could do with an improvement, but the new guides aim to help everyone, even those like myself who have the most basic of skills. We cannot wait to try some of the tutorials that are available over the next few weeks. The front of the box was really eye-catching and colourful, so Riley couldn't wait to get the box open and check out everything that was inside. There were three fun designs on the front of the box which included a rabbit, dinosaur and fairy. It was great that even on the front of the box, there were ideas to get your imagination going straight away. These design ideas also continued all around the sides and reverse of the box, so there was plenty to catch your attention. The underneath of the box provides an extensive list of all the ingredients that are used in the face paints. 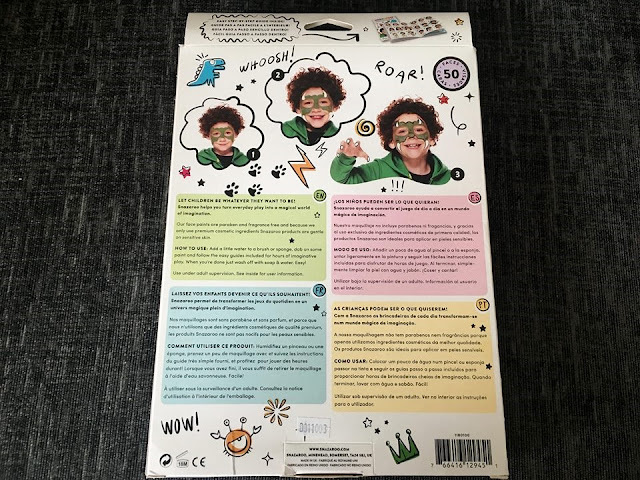 At first glance this can appear slightly overwhelming with lots of complicated words, however all Snazaroo face paints are compliant with both EU and US Toy Safety and cosmetic regulations which offers some great reassurance. Not only that, but their products are also fragrance free and gentle on sensitive skin. Another thing that I really like about Snazaroo is that their products are NOT tested on animals, which is a really important factor for me. On opening the box we found that each individual paint had a small protective film over it, which was simple enough to remove. I liked the fact that the black and white paints were much larger, since these colours are the most regularly used in most designs to add detail or create a base. The sponges were also different sizes, so we used the large sponge for the base colour and the smaller sponges for any smaller areas of application we needed to make. The large brush was ideal for creating larger shapes, whilst the smaller brush was perfect for the more finer details. Getting started was easy and I simply got a small glass of water to dampen the sponge and brushes. As the paints are water based you only need a very little amount of water on the brush or sponge and then dab it into the paint. I was really surprised at just how easy Snazaroo paints were to apply and the paint literally just glided onto Riley's face. I began by applying a yellow base colour to Riley's face. He had specifically requested that I didn't cover his eyes so we added a small outline of white to the outer eye area instead, which he was more than happy with. We then took inspiration from the instruction booklet which had come with the paints for the black around the nose, whiskers and frown lines. Riley then asked for an orange/red mane to go across the top of his head. All of these were so easy to apply and he was really happy with the outcome. Riley enjoyed pretending to be a Lion for the most part of the day and even prowled around the supermarket with his face still painted when I needed to pop out for some shopping. When it did come to removing the face paints though, this was also really easy to do. We simply used a flannel with some warm soapy water, so with them being water based paints they came off really easily and with no fuss. Now as I mentioned I am no face painting expert as you can see, but I was quite pleased with my first attempt at using Snazaroo paints. As they say practice makes perfect and I look forward to trying out many more designs in the near future. I will update this blog post with my future attempts in the next couple of weeks. There are also some fantastic videos over on the Official Snazaroo YouTube page, where you can get lots of fun and creative ideas of some face paint designs to try. Disclaimer: We received a complimentary Snazaroo Party Face Paint Kit for the purpose of writing this post. All opinions are our own unless otherwise stated.